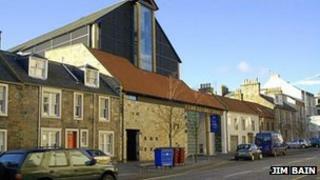 The board of the Byre Theatre in St Andrews has expressed "deep regret" over its enforced closure. The theatre, which has hosted drama productions for the past 80 years, was forced to cease trading this week after running into financial difficulties. The board said it had explored all avenues to try to keep it open, but there had been no alternative to liquidation. The building will close its doors on Thursday night for the last time. In a statement, the board said the Byre had struggled to cover its costs ever since the new building reopened after undergoing a £5.5m facelift in 2001. It said the problem became acute when the annual grant it had received from the former Scottish Arts Council ended in 2011. Cost-cutting moves and improved income streams "did little to help" the ongoing cost of running the theatre building, the board explained. It claimed ticket sales and lettings had also been good recently, including a successful pantomime and large audiences for live film streamings from the Royal Opera and National Theatre. But ticket sales were "never sufficient to cover all the overheads and staff costs". The board continued: "The board was hoping that these ongoing challenges could be resolved through the planned participation in the new Fife Cultural Trust from 1 April 2013 but, given the scale of the challenges being faced by the Byre, it became clear to us that this would no longer be a feasible option. "The board has, of course, explored all other possibilities, including consultation with Creative Scotland and Fife Council, but there was no alternative to liquidation. "The board of the Byre Theatre is extremely grateful to its highly professional and loyal staff, its many generous benefactors, including the Friends of The Byre, and to all those who have patronised and supported the Byre during its 80 years." It added: "We are greatly distressed to be announcing its closure and profoundly sorry for all those affected by so sudden a termination. We did all we could, but it was not enough." Saturday's performance of The Sound of Musicals with Donna Hazelton will go ahead, as will a charity performance presented by the Jenny King Dance Academy on 30 and 31 January. The organisers of the Fife Jazz Festival have confirmed that concerts which had been planned for the Byre would go ahead. Information about where the concerts will be held and where tickets can be purchased is being made available on their website. The Byre Theatre was originally a cow shed, but has played host to drama productions since the 1930s. It was formally reopened by Sir Sean Connery after its facelift in 2001.